The Iraqi Central Bank reassured the local market especially concerned, to seek to facilitate access to the true beneficiaries on the dollar and prevent irregularities among private banks and money transfer companies. The Bank's statement stressed the need for corporate and banking compliance requirements and standards of the international controls and instructions based on it, according to the results of the Central Bank calendar to perform compliance officers and officials reporting units of money laundering and terrorist financing and risk management units of remittance companies and private banks. And pointed to the need for compliance with disclosure requirements and investigate customers' sources of funds in accordance with the principle of «know your customer» and verified and documented, indicating the effectiveness of programs and training courses organized by companies and banks to maintain public deposits and dues to provide upon request, disclosing a direct beneficiary of remittances and credits to send to customs and tax bodies at specific times. 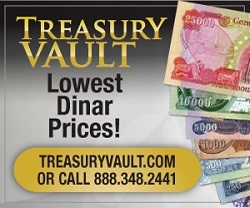 The Central Bank's reassurances came after currency markets recorded a rise of the dollar against the Iraqi dinar. And secured the State banks of cash is a direct exchange of citizens who hold a valid ticket and passport, three thousand dollars per person.